As Matariki returns and opens the season when Maori would go into the dark forests to snare birds, I plunge into my own dark to catch new ideas. 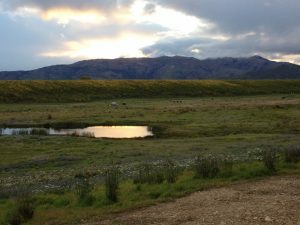 ‘I’m finding that winter writing slowly surfaces like bubbles from a fish pond, or it twinkles through the grey like Matariki peeping over the eastern horizon at dawn. Being confined indoors becomes a blessing as wind and rain obliterate distractions. I listen in more completely. The theme of each piece of writing discovers me, if I’m willing to sit in receptivity and allow a revelation process to take place. Listening to the muffled depths, that sound like a bell chiming at the bottom of the ocean, releases energy. As I heed the call to emergence, I come more fully to life. I quicken, with a little thrill. This reminds me of a moment in the south of France when, after being woken to view the distant blaze of a comet, low in the night sky, I first felt my baby’s kick in the womb. It was an annunciation, an awakening, the start of a new cycle of unfolding. And so the dark days of the new moon have become retreat times for me. I love to take time at the bach then, to rest among the trees, listen to the distant roar of the ocean, feel the enfolding darkness, and to watch the stars glittering high in the night sky. In the Maori way of maramataka, even stronger teachings apply. The new moon is the time of Te Whiro, a being of darkness and the underworld, associated with illness, disease and evil. This is a time to be vigilant and protective. When is the best time to celebrate Matariki? Matariki, the return of the Pleiades, marks the Maori new year. 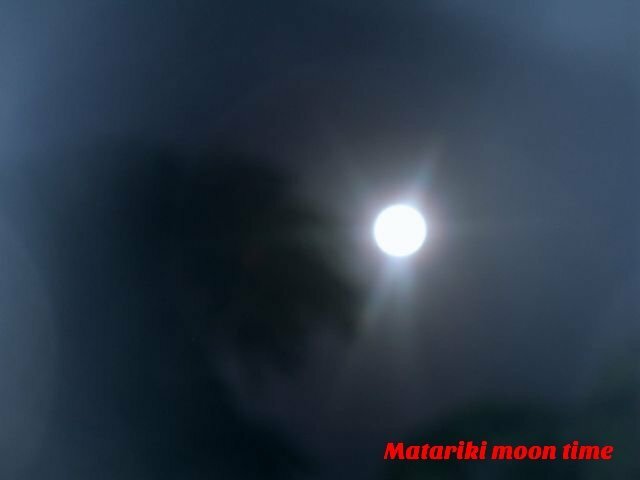 While new moon is a good time to sight Matariki because the sky is so dark, new information suggests that new moon is not the best time to hold the Matariki celebrations. Matariki in 2018 will rise around July 6-9. Matamua says that the best time to celebrate is in the tangaroa period leading up to new moon, in the last quarter of the moon cycle. This is a time of prosperity and well being. He advises that this year the celebration period falls from July 6-13. 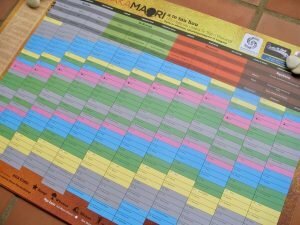 In Northland, Heeni Hoterene and her husband Reuben Taipari have developed a maramataka calendar, after years of research and deep inquiry, using a colour code to indicate the different phases of the moon, and the activities that align with those phases. Their whanau fishes, gardens and lives by the maramataka. If you would like to order one of their calendars, visit my facebook page for more information. As you listen to the distant chiming of a bell, the call of your soul, what does winter want you to know? Some people like to pick up a pen and write in a journal by way of discovery. Others like to pick up a pencil and draw, or a paint brush to make marks on paper. What is your favourite way of discovering what lies hidden? What reunion with your own self awaits you this winter? Listen in to the gift of winter’s quiet, and the Matariki new year. This blog is an excerpt from the Seasons Newsletter. To receive the Seasons Newsletter, you may sign up on the home page of this website and receive a free audio meditation. For more information about Matariki, check out my books Celebrating the Southern Seasons and Dancing with the Seasons. Thank you Marja. I hope winter supports your poetry and other creative writing too. Winter wants me to know that it is a time for slowing things down and taking stock of what needs finishing and what preparations are needed for events in the future. Art ideas come to mind. I’m not so good at putting those into action. I have committed to making a piece of art using the music symbol treble clef. I plan to paint this on a canvas, and/or to make a wooden representation. I have until the end of September to put something together. That is a great winter project. It’s a time to think deeply about what I want for my life – status quo or a few tweaks to make some change take place in my life. My mother’s death has left a gap. What’s good to fill that gap? Travel ideas abound. I wonder how I will get those done over my life time. Next stop Okarito Lagoon in October/November to see the white heron. It’s a time to snuggle up and read a little bit. To nurture myself with other ideas or to find out about topics of interest. Denise, it sounds like a very nourishing way to spend your winter, with the art project and contemplation after your mother’s death. The good thing about winter is that there is no hurry to fill the spaces. Okarito Lagoon sounds like an inspiring place to visit and see the white heron. Enjoy this time of nurturing, and thank you for sharing about your winter. Hilary, I’m glad you enjoyed the post, even though our seasons are the opposite. I hope summer catches up with you soon. Thank you.